I lose the mom I grew up with to Alzheimer’s every day. This loss began roughly 12 years ago for me and is with me every day. Others who love her live with similar loss—we each lose her in different ways and stages. You may see her smiling face in photos and think that the woman you knew is with me. You are wrong. When Daniel and I walk in, mom usually recognizes Eva the dog first, then looks up, remembering that she loves us. Or, she at least loves us for bringing a dog to play with her. She smilingly pulls the dog and I down the hall to her dresser to show us the new bracelet or socks or sweater that the guy bought her yesterday. “He’s so good,” she often says. The love and strength that it must take to awaken with a stranger in your bed each morning? Yeah, I can’t even fathom that one yet. Its a love beyond all reason. I revere both parents more as a result. 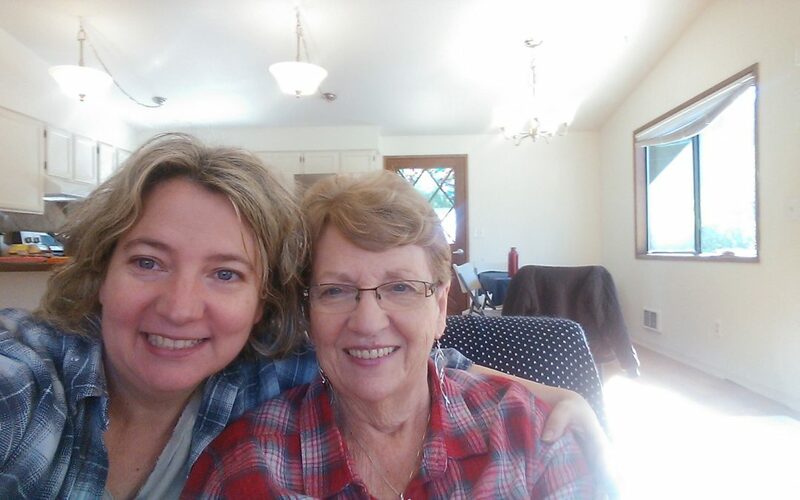 Spoken and written language gone, mom can’t tell her stories in traditional ways, so she gets creative: using props, gestures, silence, telepathy, empathy, almost-right words, and half words. Which is cool. I love her stories now: each one is a collective haiku crafted of magic. Dad’s stories have lengthened, artfully weaving past and present together: a shawl around our shoulders. Some days, while mom and I are walking down the grocery aisle she says to me “Hey! I really like you.” And I flush, flattered, knowing that she likes me as a stranger. “That must hurt,” people assume and, too often, say. But most days it doesn’t hurt. I am with a woman who likes me for me. Because of who I am in the moment. She likes me without expectations, family ties, history, or baggage of any kind. And maybe sometimes, because I just put lemon cake—a favorite of hers—in the cart. This sweet new woman likes me as a total stranger. I like her too. Loss has shown me how “I like you” can be more powerful than I love you. Loss demonstrates that the coolest stuff is always happening around the words. Difficult to see at a distance, while distracted, or worrying. Loss stills me into better noticing. This year, I notice that staying with loss has immunized me considerably against the promotion of the always-winning, always-first (and ultimately violence-inducing) cultural myth and its associated orange-haired icon that flashes out at me from all the screens. Those who scream that always winning makes us strong and powerful ultimately haven’t got a clue. Been there. So very glad to be done with that. If you want to feel strength, gently stay with your loss or a least visit on a regular basis. Listen. Hold her hand. Slow down with her. Be her friend. Walk into and through anger with her: into and through hate. Weep. Breathe. Go for a walk. Accept help from nature and cool people. Eat healthy foods. And put an occasional lemon cake in the cart to mend your hearts. That, friends, is what deep winning feels like. It honors loss. Deep winning eases minds and lifts hearts in all directions around it. Deep winning is hearing “Hey, I really like you.” from a total stranger who you—lucky you—already love like family. So beautifully written. It is very hard for those of us not near to hear of the decline. We remember her as she was when we met over 13+ years ago. And “Hey, we really like you also”. Thank you Lori. I see these same changes in our sweet Mama and I’ve learned to accept with joy each change and day just as she leads us. I appreciate your candor and I totally empathize with you and your family. Please give a kiss and a hug to my dear cousin Linda. I always admired her so much and I still do. And my respect and admiration for you Laurie has no bounds. Thanks Kathy. Will do. Love to you and your family as well.